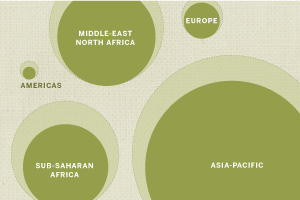 As of 2010, there are 49 countries in which Muslims comprise more than 50% of the population. A total of 1.2 billion Muslims live in these nations, representing 74% of the global Muslim population of 1.6 billion. By 2030, Nigeria is projected to become the 50th Muslim-majority country. In that year, according to the projections in this report, a total of 1.7 billion Muslims are expected to live in Muslim-majority nations, representing 78% of the world’s 2.2 billion Muslims. All Muslim-majority countries are in less-developed regions of the world with the exception of Albania and Kosovo, which are in Europe. About 3% of the world’s Muslims live in non-Muslim-majority, more-developed countries in 2010. This category is often described as the “developed world”; it includes all countries in Europe (except Albania and Kosovo, which have Muslim majorities) and North America, plus Australia, New Zealand and Japan. These countries have a total of 42 million Muslims in 2010. By 2030, they are projected to have 62 million Muslims, still about 3% of all Muslims worldwide. This report uses the term Muslim-majority countries rather than Muslim countries because many of them have secular rather than religious governments. The terms “less-developed” and “more-developed” in this report are based on United Nations categories. The U.N. describes regions as “less-developed” and “more-developed” according to factors such as life expectancy, education and income. These U.N. categories are used for statistical convenience and do not express a judgment about the political or social systems of particular countries or regions. As this report notes, there is great diversity among the countries in each category. For a detailed look at each country and its projected population, please see the Sortable Data Tables.